The biggest treasure hunt in the world is about to begin. Eleven-year-old Arkie Sparkle's archaeologist parents have been kidnapped. With the help of her genius cousin TJ and basset hound Cleo, she must find seven treasures across the seven continents in seven days. This is the seventh book in a series that's had Arkie Sparkle previously visit Egypt, China, The Arctic Circle, North Carolina, The Amazon, and Australia. This time, Arkie is in Antarctica, racing against time to find the last treasure and defeat Sebastian Sparkle. Kids who enjoy series will love that the central characters and ideas can be enjoyed all over again in this new adventure. 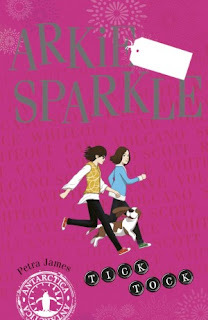 I think Arkie Sparkle, Treasure Hunter: Tick Tock will intrigue kids who are not yet sure if they like reading. There are lots of great features - the format itself is engaging, with a journal entry, side notes, diagrams, and occasional illustrations. Yes, it's a novel, aimed at kids who are 7+, but it's not densely packed text that some kids find so off-putting. The characters are also engaging, and James' writing style is active, with lots of humour. Treasures, a villain to defeat, a supersonic mini-jet, lots of problems to solve despite the pressure of time - all the ingredients needed for a fast-paced and enjoyable read. Another feature I love is that the vocabulary in the Arkie Sparkle books is not dumbed down. Thanks largely to the character of genius TJ, kids will encounter words like excruciating, katabatic, semantics and outmanoeuvred in this book. Children will also meet cool technical words like nanosecond, microchip and DATAMAX, and pick up all sorts of fascinating facts about history and the world. Those elements are woven into the story seamlessly, adding to the quirkiness and depth of the characters, contributing to our enjoyment of the story. There's an Arkie Sparkle website. There are also curriculum-based teacher notes for the series, and an ebook available from Pan Macmillan.